Hi, i'm shona! this is my story and MY OSSEOINTEGRATION JOURNEY!! I am a bilateral amputee after a car accident in May 2004. After being crushed by a vehicle for around 10 hours overnight, Surgeons had no choice but to amputate both my legs. My left leg was left with only 8cms of femur and my right is below knee. With my left leg being so short I have been unable to walk comfortably with socket prosthesis over the past 10 years as they were not practical for me to use in my everyday life. They were painful, awkward and not safe to walk with outside my home or perform everyday tasks as simple as being able to carry a cup of tea from one room to the next or hold my 4 year old son's hand while going down the street. In July 2013, I discovered Osseointegration surgery was being performed in Sydney by Munjed Al Muderis. This is when my new journey to get back walking began. 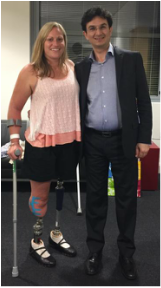 After fundraising with a coordinator and small team of committee members for 12 months, we successfully raised enough money for me to have Osseointegration surgery performed by Munjed and his team at Macquarie University Hospital, on both my legs. The first surgery was performed on the 23rd of July on my right below knee, the operation went very well and I was in hospital for a month recovering and doing rehabilitation to fully weight bear on it. The first surgery on my left leg was performed on the 29th of October. Munjed gave me a full hip replacement, the implant and a lot of bone grafting was done so the muscles and tendons could be attached. This was a shorter hospital stay to recover and heal before the 3rd and final surgery. I went back for this surgery on the 3rd of December. There was a small infection excised and the stoma was made so the inside to outside connectors could be attached. This time I was in hospital until the 24th of December so I could be home just in time for Christmas 2014. It was a huge moment for Mum, Quinn, Barry (my Prosthetist), Sarah (my Physio) Munjed and of course myself the day I was able to take my first steps. Since that day, I have been working very hard at walking everyday to gain strength, improve my posture and confidence. The muscles in my left leg will hopefully be strong enough to get my Genium microprocessor knee fitted at the beginning of March 2015. Many thanks to all who have contributed and continue to do so not only through donations but through support and encouragement!